The opening public event for HIV Awareness Month was held today [June 12] at Wesley Square in Hamilton, with free confidential HIV testing available at the mobile health van and the AIDS quilt on display as a memorial. 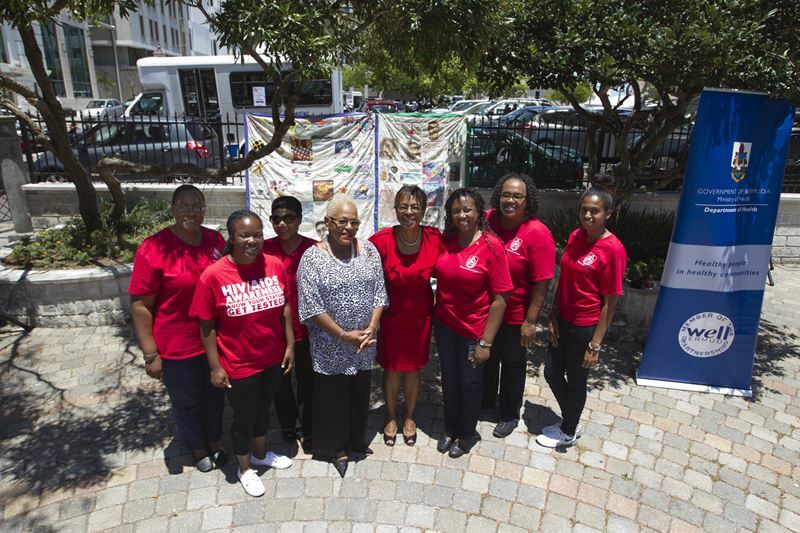 Minister of Health, Seniors and Environment Jeanne Atherden said, “During the month of June 2015 the Ministry of Health, Seniors and Environment is observing HIV Awareness Month. “HIV Awareness Month is an opportunity to promote the vision of the Joint United Nations Programme on HIV/AIDS [UNAIDS] of “Getting to Zero: Zero New Infections, Zero Discrimination, Zero AIDS-related deaths”. “Given the preventable nature of HIV and advances in HIV/AIDS care, the Ministry believes that this vision is possible. There have been less than 10 new HIV infections reported each year for the past 5 years and the latest statistics estimate that there are approximately 300 people living with HIV in Bermuda. Of these people nearly 15% are under the age of 30, nearly 60% are between the ages of 30 and 49 years, and 72% are male. “It is important to note that this only includes people that have been tested. Therefore, the Ministry is also encouraging the public to get tested and know their status. With the many advances in HIV treatment and support, this means that people living with HIV can remain healthy for a longer time. But this can only happen if they are diagnosed early. Early diagnosis of HIV helps prevent its spread and allows affected individuals to better maintain their health and productivity in society. “The Centers for Disease Control and Prevention [CDC] and the World Health Organization [WHO] have recommended that screening for HIV infection should be performed routinely for all persons engaging in sexual behaviours and at least annually for individuals likely to be at increased risk of HIV. “As free and confidential HIV testing is offered as usual, Monday to Thursday at the Hamilton Health Centre, there will be two additional opportunities for HIV testing offered during the month of June. “Today, we are here to offer free confidential HIV Testing in the mobile health van. Another opportunity will be on Monday June 29, HIV Testing Day. The Hamilton Health Centre will be offering free and confidential HIV screening all day from 9:30am through 3:00 pm, with lunchtime testing available. “The aim of HIV Testing Day is to promote HIV testing as a routine and responsible way of taking charge of one’s sexual health. The public is encouraged to get tested on this day and to discuss the importance of HIV testing with their friends, family members, colleagues, health care providers. 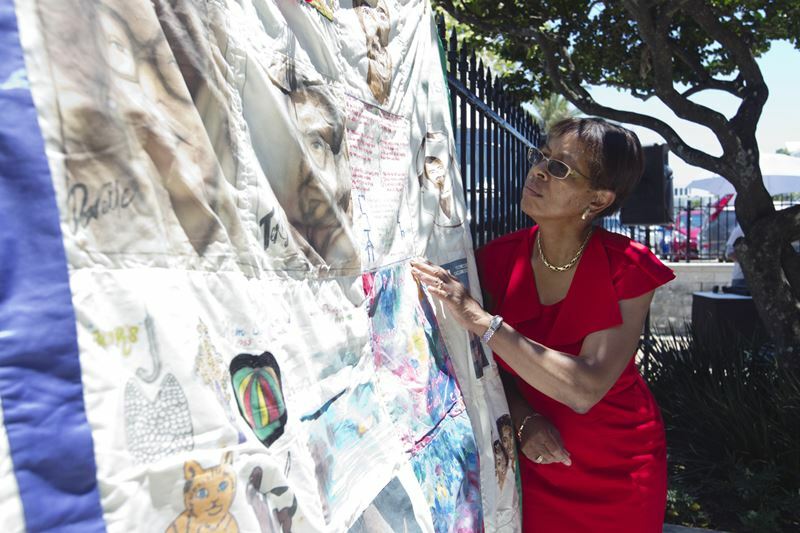 “Today, the AIDS quilt is on display as a memorial to those who have died from HIV infection and AIDS related illnesses. Mrs. Carolyn Armstrong of S.T.A.R. is with us and will provide remarks shortly. “Also, during the month of June, the public is encouraged to wear selected items of red clothing [shoes, belts, shirts, etc.] and use social media [#RockRedBDA] to demonstrate their support of “Getting to Zero”.